From the Mountains to the Sea is narrated and sung by Jeff Warner and directed by Gerret Warner. It features the voices of the singers, photographs of the tradition bearers and their land, and the insights gained by their parents Anne and Frank Warner as they traveled through rural America from 1938 to 1966 in search of old songs. Jeff and Gerret Warner grew up listening to the songs and stories of their father Frank Warner and the traditional singers their parents met during their folksong collecting trips through rural America. 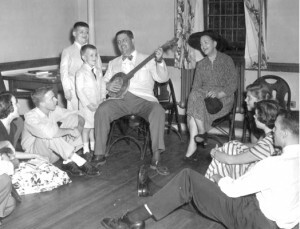 They accompanied their parents on later field trips and produced the two-CD set, “The Warner Collection, Volumes I and II,” the Warners’ recordings of rural singers, many of them born in Victorian times. Gerret is a director and editor of award-winning videos for non profits and of documentaries about education, cultural identity and preservation.”Gerret’s fine documentary work is impressive. Warner & Company clearly know how to establish a relationship with their subject evidenced by their intimate portraits of people” (National Endowment for the Arts). “The scion of one of the nation’s most eminent families of folksong collectors, Jeff represents a tradition that is fundamentally unbroken since preindustrial times” (Stuart Frank, Senior Curator, New Bedford Whaling Museum). He has performed widely, from large festivals in the UK, to clubs, festivals and schools across America. He is the editor of his mother’s book, Traditional American Folk Songs: From the Anne and Frank Warner Collection, a speaker for New Hampshire Humanities, an artist for the New Hampshire Council on the Arts and a former State Arts Council Fellow. Jeff is a founding officer of Folk Alliance International, a producer of the Portsmouth (NH) Maritime Folk Festival and past president of the Country Dance and Song Society. CDSS awarded him a Lifetime Contribution Award in 2016.